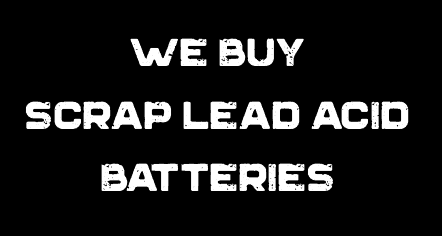 Lead-acid batteries are the environmental success story of our time. More than 97% of all battery lead is recycled. Compared to 55% of aluminum cans, 45% of newspapers, 26% of glass bottles and 26% of tires, lead-acid batteries top the list of the most highly recycled consumer product. 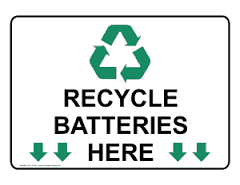 We now offer recycling for all types of batteries and e-junk. Bring your batteries to Sur-Powr! Depending on the type of battery you want to recycle three things can happen: you can get paid for the battery, recycle the battery at no charge, or pay a fee to recycle the battery. The batteries are then sorted and packaged in accordance with local, state, and federal regulations. We then ship the batteries to the appropriate recycling facility. The battery is broken apart in a hammer mill; a machine that hammers the battery into pieces. The broken battery pieces are then placed into a vat, where the lead and heavy materials fall to the bottom and the plastic floats. At this point, the polypropylene pieces are scooped away and the liquids are drawn off, leaving the lead and heavy metals. Each of the materials goes into a different recycling “stream”. Polypropylene pieces are washed, blown dry, and sent to a plastic recycler where the pieces are melted together into an almost liquid state. The molten plastic is put through an extruder that produces small plastic pellets of a uniform size. The pellets are sold to a manufacturer of battery cases and the process begins again. Lead grids, lead oxide, and other lead parts are cleaned and heated within smelting furnaces. The molten melted lead is then poured into ingot molds. After a few minutes, the impurities float to the top of the still molten lead in the ingot molds. These impurities are scraped away and the ingots are left to cool. When the ingots are cool, they’re removed from the molds and sent to battery manufacturers, where they’re re-melted and used in the production of new batteries. Old battery acid can be handled in two ways: 1) The acid is neutralized with an industrial compound similar to household baking soda. Neutralization turns the acid into water. The water is then treated, cleaned, tested in a waste water treatment plant to be sure it meets clean water standards. 2) The acid is processed and converted to sodium sulfate, an odorless white powder that’s used in laundry detergent, glass, and textile manufacturing. These batteries are recycled via a High-Temperature Metal Reclamation (HTMR) process, during which all of the high temperature metals contained within the battery feedstock (i.e. nickel, iron, cobalt, manganese, and chromium) report to the molten-metal bath within the furnace, amalgamate, then solidify during the casting operation. The low-melt metals (i.e. zinc, lithium, and cadmium) separate during the melting operation and are collected as a metal-oxide. The contents of the batteries are exposed using a shredder or a high-speed hammer depending on battery size. The contents are then submerged in caustic (basic not acidic) water. This caustic solution neutralizes the electrolytes, and ferrous and non-ferrous metals are recovered. The clean scrap metal is then sold to metal recyclers. The solution is then filtered. The carbon is recovered and pressed into moist sheets of carbon cake. Some of the carbon is recycled with cobalt. The lithium in the solution (lithium hydroxide) is converted to lithium carbonate, a fine white powder. What results is technical grade lithium carbonate, which is used to make lithium ingot metal and foil for batteries. It also provides lithium metal for resale and for the manufacture of sulfur dioxide batteries. The batteries and heavy metals are recovered through a controlled-temperature process. It’s important to note: the percentage of mercuric oxide batteries is decreasing since the passage of the Mercury-Containing Rechargeable Battery Management Act (The Battery Act) of 1996. This act prohibits, or otherwise conditions, the sale of certain types of mercury-containing batteries (i.e., alkaline-manganese, zinc-carbon, button-cell mercuric-oxide and other mercuric-oxide batteries) in the United States.